In 2005, I made a list of 5 year goals. One alluded me and that was to write a book. In a million years, I never thought I would ever write anything let alone something like Strategistics. This book started out as a collection of writings I had penned post my position running various retail outlets out of Portland, Oregon. But one can only live through the rearview mirror for so long. As I began to work with various people as well as travel the world to present my class on essentially the psychology of social media, it became quite apparent that there was much more to offer in writing this book. So, I would start again and stop again over the course of a year and a half. My hope now is that I was able to articulate well all that I have learned from my two worlds of experience. One of starting at a company making $6.50 an hour and then ten years later being promoted to not only run that company (chain of regional bookstores) but also three other businesses as well for the same owner, who by the way holds the North American record for most earned master degrees. The other being a world of travel, speaking, teaching, mentoring, as well as actually doing. To date, I have been able to consult, speak, and teach on these principles in Hong Kong, Kuala Lumpur, Surabaya and Jakarta in Indonesia, Kenya, Dubai, Beirut, Colorado Springs, Orlando, St. Louis, Atlanta, and Portland. In doing this allow them to solve the very things they are wanting to solve with their message in the first place. My favorite part of the book is the section where I got to interview people from all walks of life around the world about how they are using these new tools to deliver their message. From Four Seasons Hotel in Beirut, some local news anchors, to an organization that works with orphans with AIDS in Africa and beyond, it was an honor to learn from so many and to have them offer a little glimpse into their world. 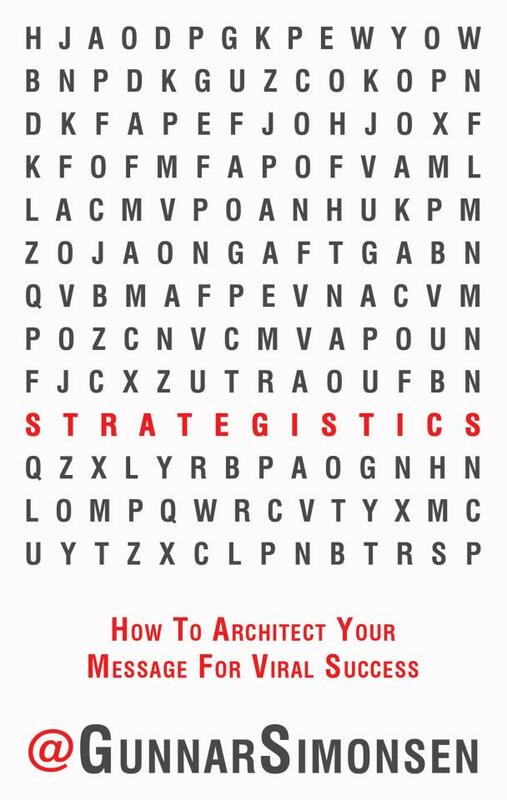 And now, Strategistics: How to Architect Your Message for Viral Success is an official book on Amazon.com. #10 in the Best Sellers in Marketing for Small Businesses Amazon.com list. Top 50 and listed as a Hot New Release in the Amazon Kindle store’s overall Marketing category!!! #11 in Hot New Releases for Marketing in the overall Amazon Marketing category which includes digital and hard copy books. So, here we are. A goal has been met. I’ve published a book. I still can’t believe it. And people are reading it? Blown away!! I am grateful! I sure hope you enjoy it. Please consider sharing this post with your community. There is a SHARE button for everything at the bottom of this post. Thank you so much!!! G! Don’t have a Kindle, no problem. Download the FREE Kindle reading app by clicking here. On Facebook? Like the Strategistics page here. Bought the book? Please consider writing a review and/or telling a friend. I am so excited to not only have a personal connection with the author, but count him as a FRIEND — even if from a distance. Even though he has shared the manuscript with me from the beginning, I immediately went to Amazon and purchased this book. I LOVE people and organizational CONNECTIONS. Thanks Gunnar for this wonderful tool! Thank you so much, my friend!!! So grateful for you and to be connected with you. Thanks for taking a moment to post this comment as well as to go download the book!! What an encouragement!! !